Google releases Files Go app that helps you free up space on your phone. 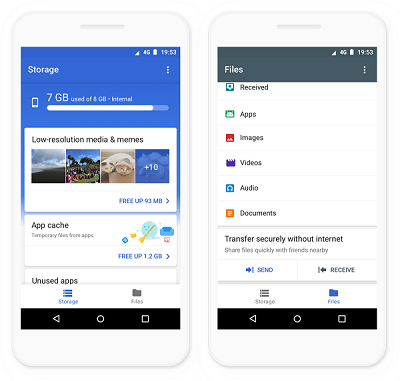 Today Google introduced Files Go, an app that takes a mobile-first approach to freeing up space, finding files faster and easily sharing them with others. Google testing Files Go for a month, and starting today it is available globally on the Google Play Store for all phones running Android 5.0 (Lollipop) and higher. Free up space. Get personalized suggestions about which files to delete, whether it's unused apps, large files, duplicate files or low-resolution videos and memes detected using Google's latest mobile vision technology. Share files offline. Transfer directly from your phone to a nearby friend's phone without using any data. The file transfers are encrypted, fast (up to 125 Mbps) and free.